It’s 9:15 pm, and you just sat along Main Street USA for the past hour waiting for this moment. In the distance, you hear clip-clop, clip-clop growing louder as your anticipation grows. Sparks fly off the pavement as the crowd gasps with excitement. In the blink of an eye, it is done and he is gone. The Headless Horseman has galloped by and the Boo to You parade has begun. The legendary rider disappears into the night. Many people, especially children do not know who the Headless Horseman is, or where he came from. In 1949, Disney released, “The Adventures of Ichabod and Mr. Toad. This animated feature had two parts, with the second one named, “The Legend of Sleepy Hollow”. The Headless Horseman is the villain of this story as he terrorizes Ichabod Crane on his ride home. He tries to replace the pumpkin that has replaced his head, with head of Ichabod. The Horseman is actually the ghost of a soldier who fought in the revolutionary war, and had his head severed during battle. The Headless Horseman character has been seen in a few other Disney projects. On the TV show House of Mouse, he can be seen in several episodes in the audience. The cape of the horseman can be seen in the Duckberg museum, in a Donald Duck comic book. His most recent cameo was in an episode of the new Mickey Mouse cartoons from last year, “The Scariest Story Ever Told: A Mickey Mouse Halloween Spectacular. The Headless Horseman has made appearances in three Disney Parks. In Hong Kong Disneyland, he hosted the Halloween celebration. He leads their parade, and has been featured in a spooky maze named, “The Revenge of the Headless Horseman”. At California Adventure, he made his first appearance in 2016 leading the “Frightfully Fun Parade”. At Walt Disney World, The Headless Horseman is the focus of the haunted hay rides at Fort Wilderness. Last year was the first year we were introduced to the “Return to Sleepy Hollow” experience. This is a ticketed event at the Fort Wilderness Campgrounds where you watch the movie and have an up close encounter with the infamous Horseman. 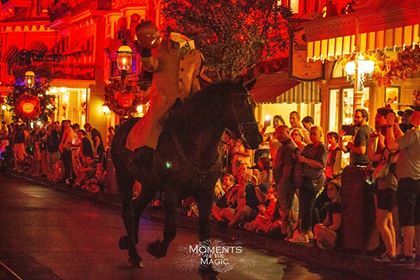 Arguably the most popular 3 seconds of the Mickey’s Not So Scary Halloween Party, are when the Horseman gallops down the parade route to start the “Boo to You” parade. It is a classic moment that is the highlight of many guest’s trips. What the future holds for the Headless Horseman no one knows. 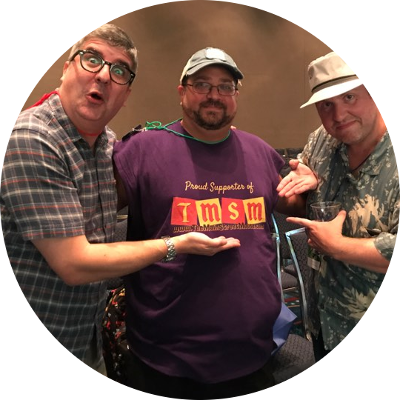 Will there be a special meet and greet in the parks one day? Will a future attraction have him in it? His popularity grows each year, and his mystique draws on the imagination of guests around the world. If you visit Disney Parks during the Halloween season, make sure you keep your eyes open so you don’t miss the legend that is, The Headless Horseman. Jarett Rutsky is a Florida native who has grown up going to Walt Disney World. Currently living in south Florida, his fondest memories from his childhood are visiting the parks with all of his relatives. Eventually his love of everything Disney led him to joining the Wald Disney World College Program where he worked mainly in Adventure Land and Frontier Land. He is now happily married and has passed his passion on to his two beautiful daughters. When he isn’t collecting Disney pins or planning his next trip, you can find him watching hockey and football games. IF any local establishments are holding a Disney trivia night, you can find him there on the winning team. He is proud to be a member of The Main Street Mouse family.